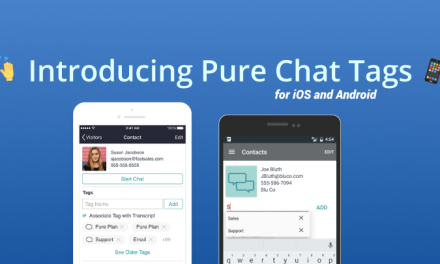 By popular demand, Pure Chat now includes an Infusionsoft integration for easily exporting chats and visitor information into your CRM account. 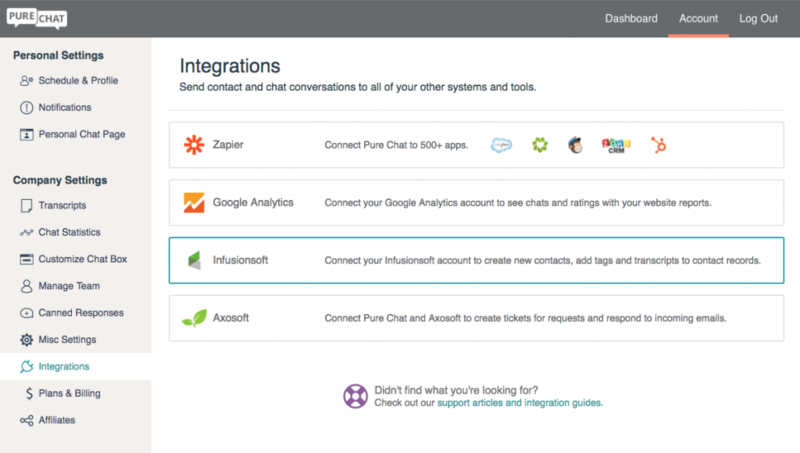 The integration works by connecting your Infusionsoft account to Pure Chat. 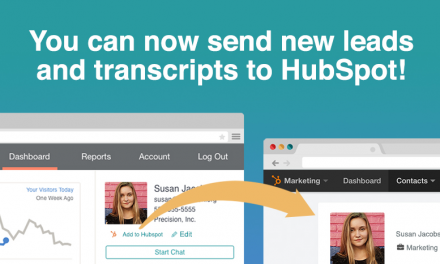 When a chat ends, you’ll have the option to export the transcript to a new or existing Infusionsoft contact. We hope this new feature makes it even easier for sales and support professionals to manage their day-to-day customer interactions. 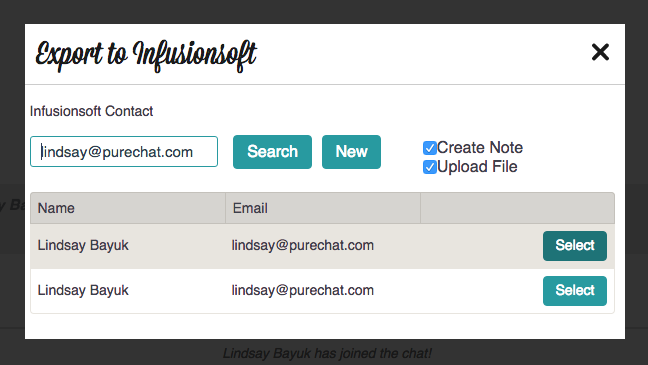 The new Infusionsoft settings are found under Account and then Integrations in Pure Chat. Select a chat box for which you’d like to enable Infusionsoft then follow the prompt to connect your account. You’ll need your Infusionsoft API key. That’s it! After a chat ends, selecting the “Export to Infusionsoft” option brings up a dialog to choose or create an Infusionsoft contact. The dialog first shows a list of suggested contacts based on the information provided by the visitor in the pre-chat form. You can also use the search box to find another Infusionsoft contact. Or, press the “New” button to create a new Infusionsoft contact altogether. Select an existing contact or create a new contact in Infusionsoft. 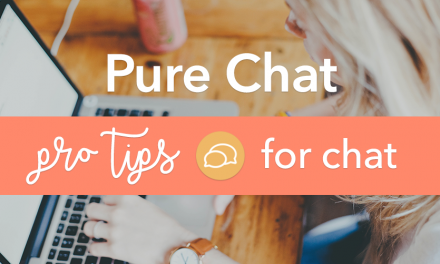 When you select or create a contact, Pure Chat will upload the transcript to your Infusionsoft account. Choose whether the transcript is exported as a note, file, or both with the checkboxes. Add a tag to a contact in Infusionsoft. And that’s it! We hope your sales and support teams will appreciate our newest integration. More are on the way, but don’t hesitate to reach out if you’re interested in integrating with our platform. 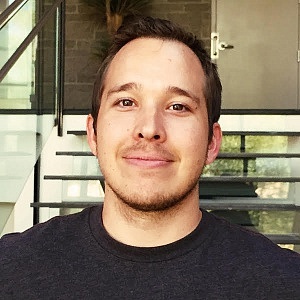 Oh, and in case you haven’t heard, we also have Personal Chat Pages, perfect for sales teams to “skip the emails” and chat in real time with prospects. You can use Infusionsoft with your team’s Personal Chat Pages, of course! We signed up for PureChat at ICON2015 and have been testing it on one of our websites. We really like your product and its ability to integrate with InfusionSoft. One major suggestion for InfusionSoft integration would be for us to have the ability to have each contact that syncs with InfusionSoft also have some InfusionSoft tags applied to the contact’s record in InfusionSoft. This could be done by allowing the administrator the ability to select various InfusionSoft tags in the set up of each Chat Widget. Thank you for your feedback Robert! We are adding the ability to add tags. Hope it helps!